Vijayanagara architecture is a vibrant combination. It has styles, idioms that prospered in previous centuries. Its legacy of sculpture, architecture and painting influenced the development of the arts long after the empire came to an end. Artists used the locally available hard granite because of its durability since the kingdom was under constant threat of invasion. While the empire's monuments are spread over the whole of Southern India, nothing surpasses the vast open air theatre of monuments at its capital at Vijayanagara. The 14th century kings built Deccan style monuments but later incorparated gopurams (large ornate structures) to meet their ritualistic needs. The Prasanna Virupaksha temple is an example of Deccan style architecture. 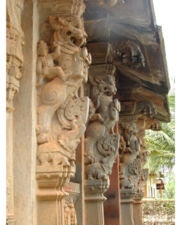 The varied and intricate ornamentation of the pillars is a mark of their work. A visible aspect of their style is their return to the simplistic and serene art developed by the Chalukya dynasty. A grand specimen of Vijayanagara art, the Vitthala temple, took several decades to complete during the reign of the Tuluva kings. An aspect of Vijayanagara architecture that shows the cosmopolitanism of the great city is the presence of many secular structures bearing Islamic features. There are many arches, domes and vaults that show these influences. The concentration of structures like pavilions, stables and towers suggest they were used by royalty. 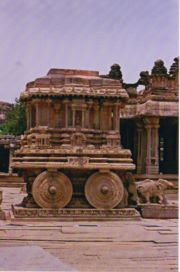 The decorative features of these structures may have been absorbed into Vijayanagara architecture during the early 15th century. Harmonious exchange of architectural ideas must have happened during the rare periods of peace between the Hindu and Muslim kingdoms.